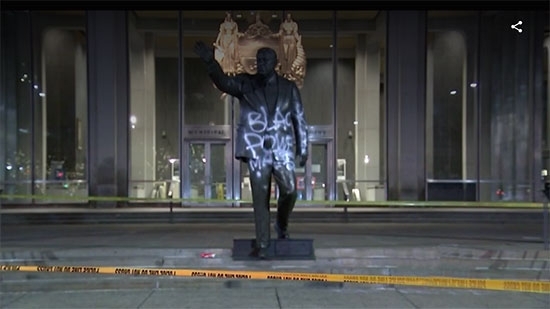 The statue of former Philadelphia Mayor Frank Rizzo was vandalized again last night. The vandals struck in full view of TV news cameras. The statue is located outside of the Municipal Services Building across the street from City Hall. Last night around 11 p.m., a man was caught on camera spray painting the words "Black Power" across the front of the statue and writing more words on the steps. Earlier this week another man was arrested after throwing eggs. The statue had been protected by barricades and a police presence for a few days after renewed calls to remove it from activists and public figures. Those protections were not in place last night. Philadelphia Police have placed a suspect in custody and city crews have removed the graffiti.